Delaware Water Gap on the AT! To keep the hiking/camping/QRP activities foremost, I’ve been trying to schedule monthly treks to not only activate AT segments but to enjoy the outdoors in different seasons and combine that with Elecraft QRP operating. 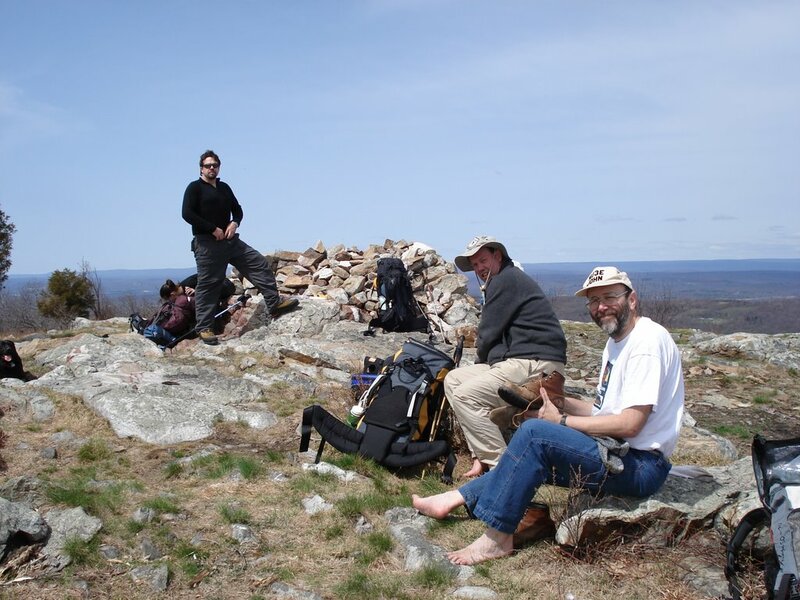 In the past six months or so there has been a lot of good fun, stories, and great HF in the field operating from a lot of very scenic areas along the AT in PA, NJ, and MA. For the month of April, WA3WSJ, NU3E, and N7UN started at the Delaware Water Gap April 15 for a two day, one way hike and campout going north on the AT. After shuttling cars, we hiked the first day about 3.5 miles with an elevation gain about 1000 ft to a “backpacker campsite” in the Worthington State Forrest on the AT. It was a large campsite, certainly able to handle 50 or more campers, albeit a bit crowded. Fortunately, we’re still early in the season, so the “hoards of Boy Scouts” we all chided each other didn’t materialize. We started hiking about 9am and the weather was clear and in the mid-60’s, perfect for the climb the lay ahead of us. Earlier in the morning we all experienced very heavy fog on the roadways so it took much longer to get to the starting point than planned. Ed, WA3WSJ, had it most difficult due to heavy fog in PA. John, NU3E, and I arrived first and shuttled vehicles while Ed was still on his way. By the time we got back the sun was out, we donned our packs and started on the trail north. Except the bridge crossing the Dunnfield Creek was washed out so we found a crossing requiring “a small jump” to get across. The adventure was beginning! About a mile into the hike, some hikers told us about a black bear just ahead. We saw him maundering about 100’ off the trail and oblivious to us. I tried to get a camera shot but the bear got in heavy brush before I could get a shot off. I had my new Garmin eTrex GPS unit with the route and waypoints programmed in so it was fun to track our progress as we labored up the trail. Soon we got away from the Dunnfield Creek and were heading up a ridge towards the campsite. Conversation was light and we all enjoyed some light, but well intended, verbal harassment, especially for John, NU3E, our “Rookie” and his efforts to reduce the weight in his pack. Still a “lot of room for improvement” John!!! The temperature was now in the 70’s, clear and with a light wind. You couldn’t ask for much better hiking weather and before we knew it we were coming into camp. We looked around and quickly set up tents and antennas after a short rest. There was a Forest Service wooden deck tent platform with a great view to the west overlooking the Delaware River. The sun was shining brightly, it was warm, and it was enjoyable. (Notice how Ed succumbed to band QSB!) The weather forecast predicted a cold front to pass near midnight so we knew it would be chilly by morning. What we didn‘t anticipate was the heavy wind! Here we go again, everyone was thinking after our February “hurricane” at the Catfish Fire Tower! I decided “it couldn’t be that bad” so elected to campout on the tent platform “to see the heavens” and the full moon rise around 10pm. 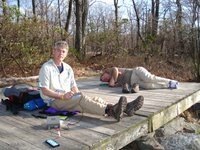 We all operated occasionally on various bands for several hours then Ed and I took a short hike to Sunfish Pond while the “Rookie” succumbed to a short nap. Sunfish, a clear water pond and about ¾ of a mile from camp, is one of the day-hiker destinations along the AT because of its scenic beauty. The trees were just coming out of their winter hibernation so it was quite pretty to see the newly minted green colors on the trees. It didn‘t take Ed or I much time to take our boots off and soak “those hot puppies” in the winter-cold lake water. We hiked back to the campsite, played QRP radio for a while although the bands were in terrible condition and contacts few, then cooked dinner. The wind was increasing but it was still very warm and pleasant. Sunset was around 7:30 pm so we got our tents and sleeping bags ready. I pitched my tent in a grassy area in away from the ridge and tent platform “just in case.” The wind was now picking up, accelerating up the ridge and then overtop of the camp area but the tent platform was directly in its path. I used my rainfly to cover my sleeping bag, tied the bottom of the rainfly to the tent platform and anchored the edges with 10 or 15 pound rocks to hold it down as the wind was now picking up. I was still holding to my conviction of “sleeping under the stars” but carefully eyeing my tent that was out of the wind. Well……the wind was now “substantial”, probably 20 mph with gusts in the 30’s! I hunkered down in the bag about 9pm and was drifting off to sleep when John was coming around to tell of his contact with a mutual hiking friend, Glen, NK1N. “Ok, great, thanks John. See you in the morning,” I sleepily replied! The wind was picking up but the stars were out in full brightness and the full moon was peeking through the trees. Far off city lights were visible on this crystal clear night. You could hear the wind gusts in the trees coming up the valley then accelerating up the ridge then to blast across the tent platform. Each gust lifted the rainfly and the anchor rocks were rattling like a marimba rhythm shaker. I was sleeping between major “gusts”. It was about 1 pm or so that the cold front came through. The wind was now gusting to 40 mph or more. My anchor rocks were in constant motion sounding like a 3rd grade drumming squad. Sleep was impossible so I moved into the shelter of my tent set up earlier “just in case.” I quickly crashed and woke up around 7am to a clear day with temps in the 40’s. Not too bad. A quick breakfast, some hot tea and a return to the tent platform for some 40m activity and a couple of quick QSO’s with folks in the Midwest. The bands had returned and there was a lot of activity. We had to pack up for we had about a 8-1/2 hiking mile day ahead of us. We cleared the campsite and heading to Sunfish Pond to filter some water and soak our feet. We hiked on and stopped at a few vista spots but the most scenic was called Mohican Mtn which had unimpeded views in all directions and especially scenic views of the Delaware River in the valley below. 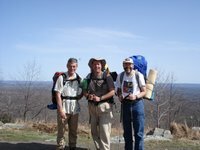 We met a Detroit husband and wife hike team that came out to section hike the AT for a few days. They were fun to talk with and we ran into them several times until we got to Camp-Run-a-MOC about 4 more miles north. Ed rates Mohican Mtn as a “9 on a scale of 0-10” in terms of vistas on the AT. We pushed on with several stops to talk with day-hikers. 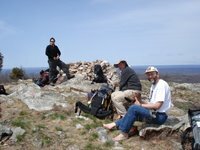 We got to our previous February hike-in spot, Catfish Fire Tower, about 1pm or so and rested and chatted with several folks while there. You can always tell the state of a good hike by the food dreams you have…..and we started talking about what we were hungry for! I couldn’t get “DQ banana splits” out of my mind and my comments must have been infectious since the other guys quickly agreed to stopping at the first DQ we saw for refreshments! From the Fire Tower, we only had about 1 mile left and our feet were ready! All of us were tired and the downhill to the parked shuttle car was welcome relief. We grinded on, got to the pickup, threw our packs in the back, and headed down from the AT towards our starting point. It wasn‘t far before we spied a DQ. I can’t even begin to tell you how good that banana split tasted as we all three basked in the afternoon sun quietly enjoying our feast and thinking we had made it through another adventure! And we were already talking about next month and continuing where we left off at Catfish and continuing north High Point State Park….maybe a three day hike this time! What adventures lay ahead? Come back next month for the update to the next chapter! !